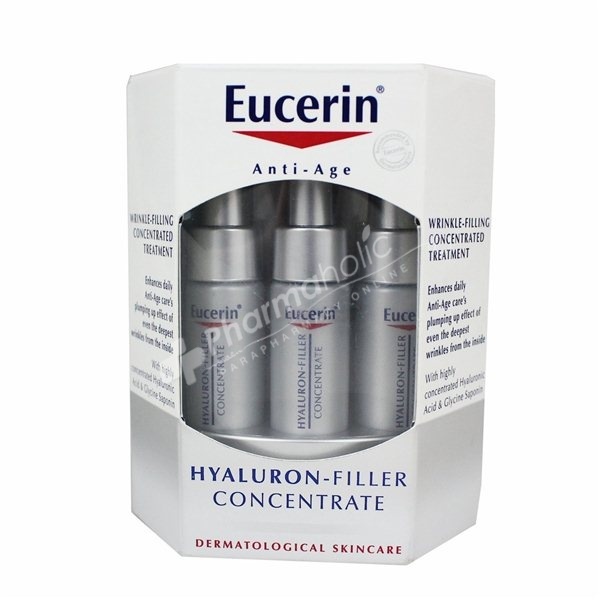 Eucerin Hyaluron-Filler Concentrate is an intensive anti-wrinkle serum to be used in combination with the daily anti-age care. - Wrinkles-filling action, even the deepest. - Restarts the natural synthesis of hyaluronic acid. Aqua, Cyclomethicone, Glycerin, Lauroyl Lysine, Methylpropanediol, Glycine Soja, Arginine HCL, Sodium Hyaluronate, Dimethiconol, Sodium Chloride, Sodium Polyacrylate, Sodium Stearoyl Glutamate, BHT, Methylisothiazolinone, Phenoxyethanol, Parfum (Fragrance). Active Ingredients: Acide Hyaluronique, Saponine, Arginine HCL, Phénoxyéthanol.